Remind everyone that no smoking is allowed in your place of business with this engraved plastic plate with aluminum holder. ADA Sign Vertical 8" x 3"
Directly and politely inform customers or staff that smoking is not allowed inside with this quality desk plate. 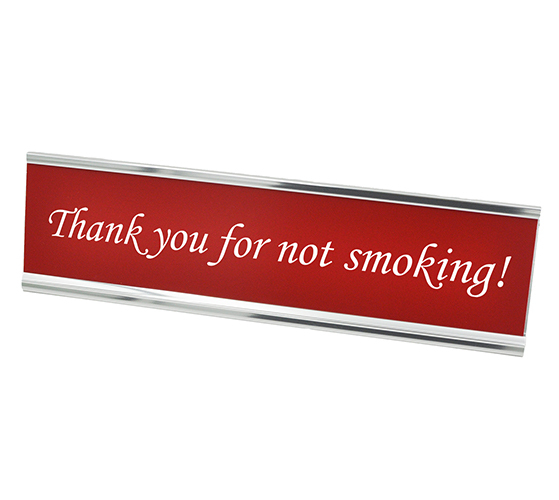 This "thank you for not smoking" desk plate reminds patrons not to light up indoors. Choose from many material colors for the plastic engraved plate, and select your choice of holder color. The plastic plate will be engraved with "thank you for not smoking" in an elegant script font and you can choose colors that will match your office scheme.